652 students activists in a statement : Demanded for the release of Yashar Ghajar and Abed Tavancheh ! It is exactly one month past since the arrest of Mr. Yashar G. the chair of the Association of Islamic Students- polytechnic University and Mr. Abed T. a member of this association and this is while in recent weeks we have witnessed a wave of summons, willful arrests and other security pressures on students .In any case, many students who have been arrested are released but Mr. Yashar Ghajar and Mr. Abed Tavancheh are still in prison and the authorities didn't provide any reasons for all these arrests.few sources inside the regime believe the reason for their arrest is because of their connection to outside the country and for their protests. The students are protesting to gain their civil rights, to have their organization , their union, hygene and secure dormitory , to have their own publication and freedom of expression. Their protests are peaceful and how can they act as a tool for the interest of foreign countries. The signatories condemned these arrests and demanded for their immediate release and asked the government to stop the scenario of labeling students as foreign elements . Akbar Ganji in Germany ! At 11:00am Tuesday morning June 27,2006, Ganji attended in the office of Radio Germany (WDR) for a press conference , many German and Iranian reporters were present. What did Ganji said in question and answer? Q: About Ahmadinejad and his atomic policy? In our country based on the constitution the power is in the hand of the leader , and whatever the president says is the opinion of the leader which comes out of his mouth, whatever the western hear is the opinion of the leader. Q- In what situation is the democratic movement in Iran? Sociologist believe on six condition for the movement and in our country two most important condition is missing , Organization & leadership.There are many forces in this movement , if we could add organization and leadership to this movement then the movement will gain speed. Today in our country violation of human rights is widely spread, there are reppression and censorship and obstinate arrest are continued , Mr. Osanlou the leader of the bus drivers union is now for months in solitary confinement, Mr. Jahanbegloo the freedom lover intellectual is in solitary confinement, Mr. Musavikhoeiniha from the student movement in the six parliament is in prison.Intellectuals have issued a statement and demanded for their freedom , they have used all possible ways to see them free but there is no result. Regime must release them otherwise we will stage hunger strike. We have a strong movement inside and outside the country who have three common openion, Democracy,Freedom and Human Rights. When i speak of " We " i'm talking about this movement. Q- What kind of help the people outside of Iran do to the movement? Q- Are you in favor of a religious democracy or secular democracy? I don't believe in any religious government , we do not want either a religious government or a religious get involve in government . Q- Are you going back to Iran and arent you worried that you might become arrested ? Certainely i would return to Iran and i haven't done any crime and i have used my human rights of free expression. If the regime arrest me will face to the world civil society and this will be the expenses that I and them will pay. I will go to prison and they will recieve the condemnation of the world. Save the life of this journalist! The last breath of a journalist in a prison in "Meshkin Shahr" ! Tabriz News - Human rights section: Danger of death is threatening the life of "Mr. Amir Hosein Movahedi " journalist from "Meshkin Shahr " and his brother said: all responsibilities for any unpleasent event lies on the shoulder of the head of judiciary power and the head of Iran's prisons organization. After a week of hunger strike and refusing to take his medication Mr." Amir Hosein Movahedi " the journalist , human rights activist and the spoksperson for the Committee of Political Prisoners Crisis in " Meshkin Shahr " prison , many times fell unconscious and now is taking the last breath . His brother Mr. " Amin Movahedi " in speaking with Tabriz news have said : "After hunger strike by my brother in "Meshkin Shahr" prison we have learned during recent days that he have fell unconscious and his life is in great danger and while the prison and revolution's court authorities know his situation but not willing to transfer him to the hospital ". He added: " Because of him being diabetic and he has to use insulin all the time and also he has a heart condition and once in the prison he had heart attack , the doctors have less hope for him to stay alive in this condition . Mr. Movahedi rejected that his brother did commit suicide while in prison , he said : " Those who spread these rumors have the intention that in case of any unpleasent event to present it as a suicide while in spirit he is copletely healthy and strong " . This journalist made it clear that in case of any unpleasent event the responsibility lies on the shoulder of chief judiciary power and Iran's prisons organization , because many time we informed the prison authorities and to Mr. Heidari the prosecutor of "Meshkin Shahr" revolution's court about the worsening situation of my brother ". Mr. Movahedi said : " Mr. Heidari the prosecutor of " Meshkin Shahr" Islamic revolution's court summoned my brother because of a complaint made by the police force of this city and sent him to prison with a bail of 20 Million Tuman ( One Canadian dollar is equal to 800 Tuman) on June 17,2006. About the charges of Mr. "Amir hosein Movahedi" he said : My brother because of his professional work and his interview with international radio and medias particularly Radio Farda on recent protest of Meshkin Shahr people about the publication of a cartoon in "Iran" newspaper a complaint was sent by police force and he was summoned to the revolution's court. Four months imprisonment for a journalist ! Nikahang Kowsar , journalist and cartoonist was sentenced to four months imprisonment by the court ! Nikahang is charged with : " Lies, insulting Mr. Mohammad Taghi Mesbah Yazdi the head of the Imam Khomeini's Educational Institute, Mr. Ali Larijani the then head of the " Seda va Sima " organization ( Islamic Republic Radio & TV ) and comparing him with Said Emami the Islamic Republic security agent who was involved to the murdering of writers and political oppositions who according to the news later commited suicide , insulting and defaming few other regime officials and insulting special court of revolution . Nikahang Kowsar is currently in abroad . 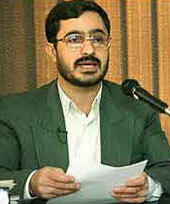 Said Mortazavi the judge of press court 1410 and a suspect in the murder case of Zahra Kazemi has returned to Tehran ! The Iranian delegate to the opening session of UN Human Rights Council in Geneva on the evening of Friday June 23 ,2006 have returned to Tehran. Mr. Jamal Karimirad minister of justice in his last day of presence in Geneva in a press conference in the office of Islamic Republic representative attended and have said: " I'm sorry that Canada does interferes into the internal affairs of other countries" . He said : "Accusation by Canada's minister of foreign affairs about Mr. Said Mortazavi is utterly untruth and Canada by doing this has moved out of diplomatic and international law ". Mr. Karimirad on the role of Mortazavi in the death of Ms. Kazemi said: " These allegations are utterly untruth and is made by western press" . He said : "The case of Zahra Kazemi have been reviewed by the Islamic Republic laws and it will be continued to be reviewed yet ". Said Mortazavi has participated only in the first opening day of the session and havn't been seen by anyone in any other places. It has been said that Mr. Mortazavi have gone to Bern and from there he went to Geneva and then he returned to Iran. Mr. Mortazavi and Jamal Karimirad were the Islamic Republic's delegate to Geneva and Mr. Mortazavi was supposed to address to the session but because of the pressure by the human rights groups was unable to deliver his speech and instead of him Mr. M. Motaki the foreign minster red his speech . In Mr. Karimirad press conference most of the questions were about Mr. Mortazavi's role in the death of Zahra Kazemi and when asked about Mr. Ramin Jahanbegloo ( An Iranian scholar who have been arrested recently ) he replied " His charges are security issues and he has right to lawyer ". Canada's diplomatic battle with Iran reached a new intensity Friday as the federal government said it is seeking the arrest of a senior Iranian official implicated in the death of a Canadian. The government wants charges brought against Iran's hardline chief prosecutor, who has been tied to the arrest of Zahra Kazemi, a Canadian photojournalist tortured and killed in Tehran in 2003. Hard-line Iranian authorities said she died of a stroke, but a commission appointed by Iran's president found Kazemi died of a fractured skull and brain hemorrhage that were caused by the impact of a hard object. Iranian reformists have said she was tortured to death. Kazemi also had Iranian citizenship. Prime Minister Stephen Harper confirmed Friday that the government asked German authorities this week to arrest Saeed Mortazavi if he stopped there on his way home from a human-rights conference in Geneva. That German stopover didn't happen, but Mr. Harper said Canada will not give up. “We're appealing to the international community to use all manner of law available to detain this individual, and have him face justice,” Mr. Harper said outside a cabinet meeting. Mr. Mortazavi, best known for ordering the closure of about 80 pro-reform newspapers, has been rumoured as an eventual contender to become Iran's justice minister. Canada condemned his presence as an Iranian representative at a United Nations human rights conference in Switzerland this week. Two Iranian government investigations have concluded that Mr. Mortazavi ordered Mr. Kazemi's arrest while she was photographing a prison, the Canadian government says. She died after apparently being beaten and tortured while in custody. Foreign Affairs Minister Peter MacKay also accuses Mr. Mortazavi of falsifying documents to cover up his involvement in the case. Mr. MacKay said Canada wanted him arrested in Germany because he could have claimed diplomatic immunity in Switzerland while attending the UN conference. Mr. Mortazavi flew directly to Tehran from Geneva. Canada has limited diplomatic ties to Iran but has not cut off relations completely. The embassy in Tehran remains open. Iran is barred from opening consulates in Canada. It has an embassy in Ottawa, but staff there need formal Canadian approval to meet any government official. Diplomatic contact is limited to discussions of the Kazemi case, human rights, and nuclear proliferation. Relations were further strained recently when Mr. Harper commented on an erroneous media report that said Iran would force Jews to wear yellow patches on their clothing as the Nazis did during the Second World War. "Honourable Minster , Ambassadors and High commissioners , distinguished delegates, Allow me to thank you very much for the honour and privilage ........"! Said Mortazavi proudly seated in UN and listening to these words ! ? Imagine this !? And this was supposed to be a new begining ....he ..he ?! Shame ! Said Mortazavi The interrogator and a suspect in the murder of Canadian -Iranian photojournalist Zahra Kazemi in the Evin prison in Tehran,Iran met the judiciary officials of Zimbabwe and Mauritania in the opening session of UN Human Rights Council in Geneva. According to "ISNA" reporter ; Mr. Mortazavi the public prosecutor of Tehran and Mr. Jamal Karimirad the justice minister of the Islamic Republic both have met with Zimbabw's justice minister and human rights commissioner of Mauritania while participating in the opening session of the UN Human Rights Council in Geneva , Switzerland. The report added : In this meeting the two delegate from Iran and Zimbabwe discussed on problems of human rights and the future work of human rights council and as well the bilateral relation between two countries. Mr. Karimirad spoke about the doctorin of the president Ahmadinejad on human rights which is: " The talented people of all countries of the world must discuss to each other on different problems of human rights ". In this meeting the judiciary delegate of Iran mentioned about the three decades of judiciary power's developement in Iran and announced that Iran is ready to host for the judiciary delegates from Zimbabwe and show to Zimbabwian about their experience specially on prison management. Mr. Chiana Masa the justice minister of Zimbabwe informed about president Mugabe's near future travel to Iran. The minister who have once visited Iran said that : We are using the experience that we gained from Iran's on open prison regulation and at present we are using these regulations in our prisons. The minister of Zimbabwe and the commissioner of Mauritania also invited the Iranian minister to visit their countries. Is he still in Geneva? He must be immediately arrested in Geneva and brought to justice ! Said Mortazavi the infamous Tehran public prosecutor of the 1410 court division , one of the suspect in the murder case of Zahra Kazemi , and the butcher of hundreds of independent newspaper and the number one enemy of the independent journalists, writers and human rights defenders participated today Monday June 19, 2006 in the opening session of the newly adopted UN Human Rights Council in Geneva. How could this happen? ! He must be immediately arrested in Geneva by the switzerland court . According to "ISNA" and "IRNA" Said Mortazavi and Jamal Karimirad two of the most hated people inside and outside Iran represented the human rights delegate of Islamic Republic in the opening session of UN Human Rights Council in Geneva. He must be immediately arrested in Geneva and brought to justice . If this is a new start of the UN Human Rights council , the presence of this man ( Said Mortazavi ) is a complete disaster for Louise Arbour ( OHCHR). A piece of a video from the danger of a nuclear disaster , the chernobyl ! No more nuclear weapon anywhere in the world ! Increasing pressure on Polytechnich ! Temporary banning order of 11 independent students publication was issued ! After the past weeks of intervention by the " Basij " and the " representative of the leadership" in the election of the amirkabir University ( Tehran's Politechnich) and the participation of 2800 student in this election and the scandalous defeat of out of place intervention of irresponsible people in this election , the university authorities at the begining of summer vacation put pressure on student activists. At the same time it was heared that the temporary banning of 11 independent students publication was issued. This action was brought to the attention of the publication editors and the editors are preparing a protest letter to Dr. Khoramshad the cultural deputy of the minister of science . in another news there has been saying that during the 10 days of protest by the Polytechnich students, tens of summons from the deciplinary committee of the university was issued for the student activists. Reporters are banned to cover the events in the university and in one instance a reporters camera was broken by university guards and students activists could only speak to reporters from behind the bars of the campus. Spokeperson for judiciary power : In the women gathering in Tehran 70 person was arrested and currently are in Evin prison. In the gathering of " 7 Tir " square on last Monday, 70 people were arrested, out of this 42 people were women and the rest are men" . Mr. Jamal Karimirad the spokeperson for the judiciary power in a press conference in his office in Evin prison with the presence of reporter have said:" These people are in Evin prison and i have heared that ; some of these arrestees in that gathering have spoke contrary to the divine law " . 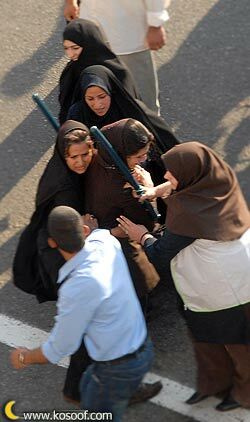 Women's peaceful protest for their rights was crushed by regimes men and women police force and agents ! Protest to compulsary retirement ! A group of students from Elahiat College of Tehran University in a petition protested to the compulsary retirement of their professors ; Dr. Mohammad Mojtahed Shabestari and Dr. Hadi Alamzadeh .
" We express our protest to this and demand for their official retun .......... ". IRAN WATCH CANADA: It is needed to say that since the new president took office many independent and liberal minded professors were removed from universities. Thats why IRAN WATCH CANADA believed that ; president Ahmadinejad came to power with an agenda to suppress the freedom movement and to remove all the elements behind this movement . One and a half year prison term for attorney Mr. Ghasem Sholeh Saadi ! Mr. Ghasem Sholeh Saadi the attorney of the court is sentenced to one and a half year prison by the division number 26 of the court of revolution. Mr. Sholeh Saadi in speaking with "ILNA " said: "I have been charged with propaganda against the state and insult , this charges are about an open letter which was published ". He added : " I will appeal against the court order" . Rough suppression of the women's peaceful gathering in Tehran ! The women's gathering in" Hafte Tir " circle in Tehran was severly suppressed by the Especial forces and security forces and more than 60 person is arrested . According to Advar news reporter from "Hafte Tire" circle in Tehran , the police forces , among them women police officers could be seen with green uniform and equiped with Batum and tear gas attacked the women in order to disperse them. This gathering was a protest to the anti women law of the Islamic Republic and was organised by the many human rights activists . The gathering started with close to 5000 in " Hafte Tir " circle at 4:30 pm. The women protesters with placards and slogans in support of women's rights rallied in and around " Hafte Tir " circle was attacked by the police and security forces and plain cloths agents . According to Advar News reporter ; Four mini bus of police forces which was sent to the gathering area was filled with women protesters and drove away to an unknown place. This reports added : In addition to severe physical confrontation which caused many protesters to injuries , many women and men were also ended with breathing problems because of the use of tear gas and pepper spray by the police forces. Also in this morning and in continuation of many more phone threats by security agents Ms. Shahla Entesari, Ms. Parvin Ardalan , Ms. Firuzeh Mozafari and many other women were arrested . In this protest " Advar Tahkim ", women activists , human rights defenders and member of the bus transit union were participated. 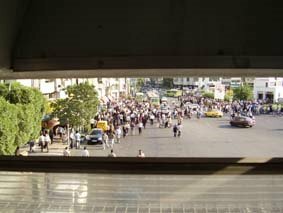 Iranian men and women against legal discrimination of women plan to hold a rally in Tehran on June 12th, 2006 to demand banning polygamy, ending men’s uncontested right to divorce, equal child custody rights, equal rights in marriage, the increase in the legal age of children to 18, and the elimination of temporary work contracts, among others. Five women Nobel Peace Prize winners Shirin Ebadi from Iran (2003) Judy Williams from the United States (1997), Betty Williams from Ireland (1976), Wangari Muta Maathai from Kenya (2004), and Rigoberta Menchu Tum from Guatemala (1992) have supported this rally by signing the public call. In their statement the women express their solidarity and support for Iranian women in their struggle to gain equal rights under the existing laws and regulations in Iran. Iranian women plan to sign a petition calling for equal rights in Iran and then through their connections and influence and civil institutions pursue the issue. Following the announcement of the rally, a number of Iranian women activists have been summoned to the offices of security and intelligence agencies in Iran. Similar summons preceded the March 8th international women’s day rally in Iran where officials requested the organizers to cancel their rally as it was legal because it did not have a permit from government authorities. But women have challenged the government’s position by arguing that article 27 of the current Iranian constitution negates the need of a permit for a peaceful demonstration. A similar meeting was held last year where a communiqué was issued at the conclusion of the rally. This year, the organizers plan to read out last year’s communiqué and talk of progress made on the demands. Last year’s demonstration was considered to the largest women’s rally since the hijab rallies in the early days of the Islamic republic after 1979. In the history of women’s movement in Iran, last year marked a turning point as the many organizations and groups active in women’s issues, formed a single platform and formed a coalition on at least a series of common goals. That has paved the way for stronger cooperation among them. An Iranian judge has decided to reopen the 9-year-old mysterious murder case of a flight attendant which was initially closed because of the interference and lobbying of top intelligence officials at the time. An Iranian judge has decided to reopen the 9-year-old mysterious murder case of a flight attendant which was initially closed because of the interference and lobbying of top intelligence officials at the time. Some of the former intelligence officials who may have been involved in the murder currently hold positions in the government of Mahmoud Ahmadinejad, which has prompted about the motivations behind the reopening. Akbar Ganji, Iran's prominent investigative journalist was the first person to uncover Ghaem-Maghami's murder and view it as an act of government agents. He published his story in Sobh-e Emrouz newspaper. He threw light on the case while top intelligence officials were trying to present the case as an ordinary murder caused by family feuds. Similar attempts were made to cover up the murders of Pirooz Davani and Majid Sharif, both victims of the serial killings of the intelligence ministry. 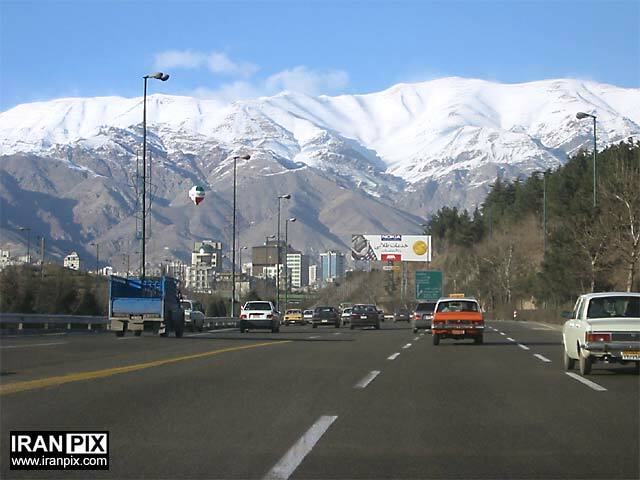 Following these two killings, influential intelligence officers had tried to limit the investigations over the murders to just four revealed cases of Parvaneh and Dariush Forouhar, Mohammad Mokhtari and Jafar Pouyandeh. Akbar Ganji and Emadeddin Baghi were two investigative journalists who continued to uncover other cases of killings by intelligence agents by publishing their revelations in Sobh-e Emrouz. At the time, a number of senior government officials protested the revelations which had by then attracted public attention and remained in the limelight. Soon after the reactions to the suicide of Saeed Emami, a former deputy at the minister of intelligence and the person who has been charged with many of the killings of dissidents, a number of Iranian dailies were suspended, Ganji and Baghi were imprisoned and an unsuccessful assassination attempt by agents of the intelligence ministry left Hajjarian crippled for life. Hajjarian was himself a senior intelligence official and has been tipped to have been the informant for the revelations inside the intelligence community as he had become a supporter of reformist president Khatami and advocated democratic principles. At the time of the serial murders, Zan publication wrote that Ghaem-Maghami's husband had been summoned to the committee that was investigating his wife's murder and had been banned from speaking to the press. He was warned that the murderers may flee the country if he talked to the media. Faezeh Hashemi, daughter of Hashemi Rafsanjani was editor-in-chief of Zan at the time and the publication was suspended on orders of the judiciary. Nine years after murder of Ghaem-Maghami, division 1157 of the criminal court has a new judge, judge Zamani Alavijeh who has decided to re-open the controversial file. It is said that he has ordered the special intelligence division of the police to investigate her murder and the murders of other women that appeared to be similar in circumstances between the years 1996 and 1997. The new judge may be looking for clues and similarities or connections in the murders. He is quoted as saying that 5 women were murdered during that period. The investigation that includes relatives, friends and those that had been in touch with the murdered women will start soon. The news of reopening the controversial case has raised questions among political and judicial circles in Tehran. The timing of the decision raises questions about the motivations behind the reopening. It should be noted that some of those imprisoned in connection with the murders have since been freed and some have even been appointed to intelligence posts in Ahmadinejad’s government. The circumstances raise the question of whether the reopening is really the decision of a single judge or there others driving or directing the process. 10 days without any news from Mr. Human Kazemian the student of Tehran University ! There is no news from the situation of Mr. Human Kazemian the student activist of Tehran University ! It's 10 days that Human Kazemian the student of Tehran University is disappeared and until now he didn't make any contact with his family and this issue made his family very much worry about Human. This is happening while in the last few days Mr. Abed Tavancheh and Mr. Yashar Ghajar in a contact with their family have informed them that they are in detention in Evin prison. It is every women's rights to go to the stadium and watch the games ! Last Wednesday May 31st ,2006 , Iran's national soccer team had a friendly play with Bosnia. This game was in preparation of Iran's team for the coming world cup in Germany . Several young women ( The same group which started a campaign for women to be allowed to enter to the soccer stadium and to see the games ) attended at the door of the stadium before the game started. 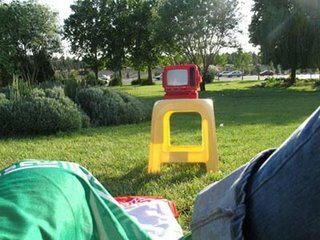 Because they weren't allowed to see the game, they brought a small TV and displayed it outside the stadium as a symbolic gesture and displayed it on the lawn close to the door of the stadium to watch the game . The police force as well as the " sister police force " were ready to deal with this group of women .They banned filming and taking picture and in one case took the camera of a young woman and arrested one person who was released later . The police forces were asking the group to disperse and go home . The " Sisters police force " were telling the group that : " Why do you want to go into the stadium .In there you will hear indecent words ". We told them that : " Let us to decide , we are not kids that others will decide for us " . One of the reason for banning the women not to see the soccer game according to the Islamic Republic law is that the women are not allowed to see the bare feet of the soccer players !? . It is needed to say that the Islamic Republic also banned women's game to be viewed in TV. Women have other rights too , what about their other rights ? "My share, women's share , Half of freedom " ! To enter to the stadium is our legitimate rights ! This award belong to the Iranian freedom lovers! Akbar Ganji, the Iranian journalist, Today Monday June 5, in the 2nd " World Association of Journalists " in Moscow recieved the golden pen award of the 2006 . The ceremony of recieving the golden pen was held in Keremlin Palace . The four days session of the "World Association of Journalists" from yesterday Sunday June 4 , with the participation of 1500 managers and editors of the world creditable newspapers begin in Moscow. Mr. Ganji after recieving the award have said: The award that was given to him belong to all freedom lovers , those who believe different than the authorities and to all Iranian journalists who have lost their life in defending the freedom and human rights or in a way were deprived from their social and civil rights. IRAN WATCH CANADA will bring you the full message in a bit later. Women are going to get together and protest to abolish the laws that are against women! "They are willing that the Lawyers Association be disappeared" ! "Threat to organizations , associations and NGO's as always was continued but in recent months it has been increased and the Lawyers Association in Tehran wasn't the exception". What the Government of Ahmadinejad is busy with since the innaguration of his government is to bring back the trend of eight years of shallow-reform by the reformist government of Khatami.Khatami was elected because of his promises to intellectuals , women , laborers , workers and most especially to the students and because of his promises 20 million youth droped their ballots in his favor . Although Mr. Khatami wasn't the man of action and believed in the leader of the Islamic Republic but his shallow-reform spread roots quickly in the Iranian society and so it would become hard now for Ahmadinejad to annihilate all these changes . The government of Ahmadinejad as soon as it came to power started to creat smoke screen and rhethoric such as anti Israel campaign and nuclear issues in order to divert the world attention as well as the Iranian from it's main agendas which is to suppress the rising democracy and human rights movement in Iran. During the eight years of shallow -reform the independent newspapers, journalists , non-governmental organizations on human rights, women's rights , journalists rights , labors rights and ..........was established and made connection among the Iranian society . Ahmadinejad's government was assigned to carry an agenda by the suprem leader and other Islamic Republics guardian agencies,the agenda to create an international political crisis, even if it enters into the war ( which will possibily end up with negociations ) , in order to increase the national sentiments and under this athmospher to suppress the democracy and human rights movement in Iran. This is what we are witnessing today . will they succeed ? Absolutely not , It will backfire , only time will tell. Free Mana Neyestani the cartoonist ! The office of " Nedaye Azarabadegan" newspaper in the city of Tabriz is sealed off ! Yesterday at noon time the office of the " Nedaye Azarabadegan" newspaper in the city of Tabriz is sealed off . According to the report by ILNA and in speaking on one of the employee of this publication , the police agents by presenting the court order yesterday at noon time sealed the office of this newspaper until unknown future date. According to the reporter of " Nedaye Azarabadegan " newspaper the number 291 and 292 issue of this newspaper could not be published and distributed. News indicate that the Kiosk for selling this newspaper which is belong to this company is also closed. This newspaper is one of the oldest nespaper in Eastern Azarbayejan province. The editor and manager of this newspaper is Mr. Abolfazl Vasali .